Look out, Flintstones—there’s another funny Stone Age family in town. The latest computer-animated adventure from DreamWorks (SHREK, MADAGASCAR) follows the titular clan of Paleolithic people as they search for a new home and embrace change during a time of tectonic upheaval. We’ve seen earthquakes, eruptions, and exodus in the ICE AGE and LAND BEFORE TIME franchises, but the creators behind THE CROODS bring enough new material to the caveman caravan to keep viewers engaged. They also mix movie tropes, combining the dinosaur dynamics of LAND OF THE LOST, kooky kinships of The Simpsons (with their good-hearted but lunk-headed father), and the familiar premise of overbearing father versus independent daughter. The result is QUEST FOR FIRE meets The Family Guy. Grug Crood (Nicolas Cage) is the hulking, uni-browed patriarch of the only family left alive in his part of the ancient world. He’s got a one-track mind, living only to ensure the survival of his brood, whose members he keeps bouldered in a cave, safe from the perils of the prehistoric wilderness. In the Croods’ version of Bedrock, carnivores lurk in every crevasse. Darkness means danger and curiosity kills. “New things” are bad. “Never not be afraid,” Grug admonishes his kids. Nine-year old Thunk never questions his father. He’s a chip off the old block—a burly boy with inflated arms and small cerebellum. Grug’s wife Ugga (Catherine Keener), feral infant daughter Sandy (Randy Thom), and tagalong mother-in-law Gran (Cloris Leachman) agree The Cave means life, whereas just about everything outside holds certain death. But Grug’s inquisitive teenage daughter Eep (Emma Stone) feels smothered and bored. Grug “grounds” Eep for breaking “curfew” one night—but his role as provider-protector is challenged by the appearance of a younger, forward-thinking male who has eyes for his feisty daughter. The newcomer, Guy (Ryan Reynolds), is something of a pre-Renaissance Renaissance Man who’s been forced to adapt—even evolve—because he’s lived alone so long. Well-groomed and articulate by troglodyte standards, Guy teaches the Croods to make fire and trap their meals instead of risking themselves in the hunt. He shows Eep how to use a horn for long-range communication (an early cell phone). Later, he introduces footwear. Eep is spellbound. We fathers are often the last to recognize when it’s time to let go of the people and things we hold most dear. Like so many well-intentioned movie dads, Grug has difficulty admitting he’s wrong, or that his way of doing things may no longer be best. He’s a stubborn Alpha Male ape-man with plenty of brawn, if very little brain, so he keeps Guy imprisoned in a log and as far from Eep as possible—until the newcomer’s end-of-the-world prediction comes true and their hallowed cave is demolished in a cataclysmic shake-up. The Croods must find a new home in the strange new world revealed by the massive rockslides. Grug begrudgingly defers to Guy’s resourcefulness on a family trek to a pair of mountains that might be the gateway to a promised land Guy calls “Tomorrow.” Along the journey the Croods encounter whale-like beasts that walk on land, a persistent Technicolor tiger, and a flock of piranha-like birds that can strip animals of their flesh in seconds. Grug competes with Guy for his family’s admiration while learning to entrust Eep with the freedom she needs to truly live, and some of the movie’s funniest moments arrive via his cockamamie ideas (caveman versions of sunglasses and Polaroid cameras) and temper tantrums. Maybe I’m as outdated as Cage’s Pleistocene papa, but I’m still fascinated by the myriad colors and incredible textures concocted by computer animators. The Croods’ hair appears mangy and lifelike, their animal print hides realistic enough to accommodate fleas. Rocks and sticks look as if you could actually pick them up and toss them in one of the film’s rivers, where the water splashes like it should. 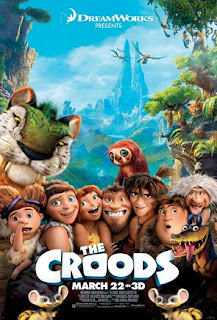 THE CROODS’ 3-D is put to good use in exciting sequences featuring creatures and cave-ins (night scenes with a starry sky and dancing embers from a torch really stand out). Naturally, eye-popping effects are for naught if your story isn’t tight and your performances memorable. But directors Kirk DeMicco (SPACE CHIMPS) and Chris Sanders (HOW TO TRAIN YOUR DRAGON) have their ducks (er, dinos) in a row here. Sanders himself voices Guy’s dramatic pet sloth, Belt (he played the mischievous alien in LILO & STITCH). Emma Stone (of ZOMEBIELAND and THE HELP) charges the adventurous Eep with a growing girl’s boredom—then defiance, wonder, and love. And in what seems a peculiar casting choice on paper, Cage delights as the perpetually flummoxed Grug, imbuing the lowbrow leader with the mania he gave Sailor (WILD AT HEART) and Johnny Blaze (GHOST RIDER), the wit of Ben Gates (NATIONAL TREASURE), and the sympathy of his more “human” characters like Jack Campbell (THE FAMILY MAN). Ryan Reynolds (GREEN LANTERN) gives pep and enthusiasm to his clever Cro-mag. It all adds up to solid, family-safe entertainment for Spring Break season. 3 out of 4 stars.